While Lance and his wife were enjoying their dive, their boat had come loose from the mooring and drifted away. After clinging to the mooring ball for what seemed like hours they were spotted and picked up by a boater who had heard on the marine radio that an unoccupied boat had been found adrift. Another boat had retrieved the vessel a short distance downcurrent and secured it to a mooring. Lance was lucky; his boat was retrieved undamaged and eventually he and the boat were reunited. Aside from the time spent bobbing on the surface awaiting rescue and the agony of not knowing what had happened to his boat, Lance came out of the ordeal with a bruised ego, but otherwise OK. This is not always the outcome when those who dive from private boats violate the basic safety rules. Lance should have left someone on board the boat while he and his wife were diving. This is a cardinal rule of diving from a private boat. Beyond that, the boat must have been improperly tied to the mooring; otherwise, it would not have drifted away. Diving from a private boat is more involved than most divers think. And it is an activity for which few new divers are well-prepared. 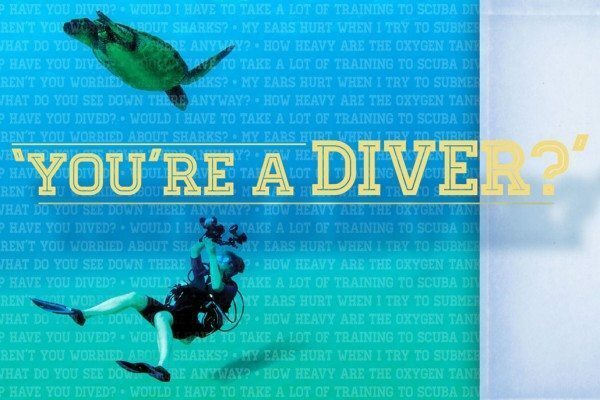 When a diver is handed a certification card it is proof that he is qualified to dive in the conditions similar to those in which he was trained. A minority of divers do their open-water training dives from a private boat. Therefore, few newly certified divers are qualified to dive from a private boat, unless accompanied by someone trained and experienced in this type of diving. Diving from a private boat requires the skills of both boat captain and divemaster. One person on board must assume the duties and responsibilities of captaining the boat. This is not a task to be taken lightly. Safe boat handling, which is serious business when simply out for a pleasure cruise, is even more of an issue when divers are involved. Anyone responsible for the operation of a boat — large or small — should be trained and licensed, if possible. The U.S. Coast Guard Auxiliary and other nautical organizations offer basic boating rules and boat handling courses (see sidebar). If you own a boat, whether or not you plan to use it for diving, it is highly recommended that you attend such a course. Someone on board must also assume the duties of divemaster. This person needs to coordinate the decisions about where and when to dive and the type of dive to do: anchored boat, drift, etc. On dive charter boats these decisions are already made for you, but when diving from a private boat someone on board must assume the leadership role. The captain and divemaster can be the same person, or two different people. The important thing is that the bases be covered — that someone on board is responsible for handling the boat and someone for coordinating the diving. There is significant responsibility associated with each. Except for a few very remote third-world dive destinations, the people you find at the helms of commercial dive charter boats are licensed captains. They are trained in boat handling and maintenance, safe boating practices and first aid and are prepared to react to emergencies. Anyone who assumes the responsibility for captaining a private boat, even though they might be unlicensed, should possess similar skills and knowledge. Before putting the boat in the water or departing the dock, the captain should have completed a thorough boat check of the vessel’s major systems, accurately monitoring the boat’s fuel, engine oil and water levels, if applicable. Anyone taking a boat out on the water should possess basic knowledge of the boat’s systems and how to make minor repairs if one of them fails. Before a dive boat leaves the dock, the captain should be aware of weather and water conditions and the near-term forecast. Restricted visibility, rough water and windy conditions make for poor diving and increase safety concerns. Whoever is captaining the private dive boat must monitor these conditions and be prepared to turn back or even cancel the outing before departing the dock, if the situation warrants. Likewise, the captain should be able to read weather conditions as they unfold. If conditions unexpectedly change, the captain should make the call to head for calmer water or return to port. The captain also should be familiar with the area being dived. There are places private boats should and should not go such as shipping lanes and restricted areas. Likewise, there are areas that should not be dived such as high-traffic areas and restricted marine preserves. If the person taking responsibility for captaining the boat is unfamiliar with the area, he or she should do the necessary research before embarking. Most of the boating skills already addressed are used by all boaters, regardless of their purpose for being out on the water. However, there are several boat handling skills that may not be critical to boaters in general but which are vitally important to those captaining a private boat from which diving is being done. Being skilled at anchoring a boat and tying to moorings is important for a captain operating a dive boat. Diving is typically done on fragile reefs, shipwrecks and other man-made underwater features. A dive boat captain needs to have the proper anchor to hold the boat fast, enough line for the necessary scope and know the appropriate location to place the anchor, based on water and wind conditions. Dropping the anchor on top of the reef could seriously damage the environment. Allowing an anchor to drag into the dive site can be damaging and unsafe, not to mention that a dragging anchor leaves the boat in a different position than when the divers descended. And an anchor that drags until it snags on something may require divers to descend and dislodge it. A dive boat captain must be skilled and practiced at maneuvering the boat into position to allow floating divers to safely reboard the vessel. The boat’s position must provide a safe exit platform for the divers. Wind and water conditions and the proximity of water hazards are important considerations when making such a maneuver. Throughout the exercise the captain must maintain a keen awareness of the depth of the surrounding water and the presence of potential hazards. Deciding where and how to retrieve a diver floating on the surface is especially critical when “live-boating” or drift-diving, but such a maneuver may also be required when diving from an anchored boat, if the anchor were to drag or a diver surfaces far away from the boat and must be picked up. Similar maneuvering skills are required when positioning the boat so divers can enter the water at the beginning of a drift dive. Each situation is unique, based on wind and water conditions. The captain and the person on board serving as divemaster must collaborate on determining the safest entry and exit plan. And then the divers must thoroughly understand what to expect and what is expected of them. Because the boat is not at anchor or moored when divers enter or exit the water, live-boating is more dangerous and requires more coordination than diving from an anchored private boat. 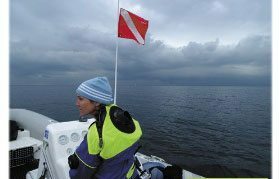 The captain of a running boat, whether it is making way or not, must be especially cautious when divers are in the water — not just divers from his or her own boat, but also divers from other boats in the area or even from shore. Bubbles breaking the surface are an indication that divers are below. However, you cannot count on the divers being positioned directly below the bubbles — current moves bubbles horizontally through the water column and the diver swimming can cause the bubbles breaking the surface to be in a slightly different location from the diver. After maneuvering into position to drop off or pick up floating divers, the captain must ensure that the boat is not in gear — the propeller is not engaged — before divers enter the water or swim to the boat to exit. It is even safer if the engine can be turned off during this maneuver, if practical. Prior to a live-boat drift dive all divers should be thoroughly briefed on how the pickup will be performed. They should be instructed to remain in a group after surfacing and that the captain will maneuver the boat to within a safe distance before giving the OK signal that it is safe to approach the boat. Divers should never approach a running boat until instructed to do so by the divemaster or captain on board. The most important and often-violated rule of diving from a private boat — one that my friend Lance learned the hard way — is to always leave a responsible person (people) on the boat when divers are in the water, preferably someone with boat handling experience. The person must be capable of operating the boat, using the radio, handling emergency situations and recalling divers, if necessary. He or she should be attentive to the divers in the water, monitoring their whereabouts by watching the bubbles, listening for voices and calls for assistance and staying awake and not getting overly occupied with other activities. Being left on board to tend the boat is a very necessary and responsible position. Captaining any private boat is a significant responsibility. However, taking on the responsibility of captaining a private boat that engages in scuba diving is even more challenging. Every private boat should be equipped with the basic safety gear recommended by the U.S. Coast Guard or other governing agency, but a dive boat requires additional diving-related equipment. The first item that comes to mind is the dive flag. Any boat engaged in diving must display the traditional red and white diver down flag, the blue and white alpha flag, or both (see sidebar). These signify to other boaters that they should keep their distance, as people are diving near the boat. Not all private boats are equipped with marine radios. However, private boaters engaging in diving should strongly consider having a marine radio on board. In the event of a diving accident, a radio proves invaluable for summoning help and/or coordinating transport of the victim. A cell phone should be carried, too. A private dive boat should be equipped with basic navigational equipment and charts, if available, but, as mentioned earlier, a GPS receiver simplifies locating dive sites, if the coordinates are known. In addition to the standard first-aid kit, a well-equipped private dive boat will have a medical oxygen tank and appropriate delivery system. Having oxygen on board could mean the difference between permanent disability and complete recovery of a diver involved in a decompression-related diving accident. Dive accident oxygen systems are available through Divers Alert Network (DAN). Every dive boat should have some sort of diver recall system or at least a routine for signaling divers that an emergency has occurred and that they need to surface immediately. Such a routine should be communicated to the divers during the boat briefing. A life ring with sufficient line attached to serve as a current or tag line should also be on the equipment list of private boat owners planning to dive from their boat. This is useful when diving in current or if a diver surfaces and cannot make it back to the boat unassisted. If he is not too far away, the ring can be tossed to him and the attached line used to pull him and the ring to the boat. To aid the boat operator in spotting divers after they surface, each diver should be equipped with a surface signaling device such as an inflatable “safety sausage,” which is visible from a distance, and a whistle. This can be a simple human-powered marine whistle, or an air-powered model such as the Dive Alert™, which attaches to the buoyancy compensator (BC) low-pressure inflator hose. These important safety accessories are available at your local dive retailer. In addition to safety-related equipment, a private dive boat needs to carry a few spare parts and backup dive gear. Tank valve O-rings are a must, as are spare weights and a set of diver’s tools. To avoid the need to sit out a dive when equipment malfunctions, the boat should have on board a spare buoyancy compensator, regulator setup, mask and a set of fins, in addition to a spare-parts kit. Spare dive gear and parts most likely will not be the responsibility of the boat owner, but among the divers on the boat, all of the above-mentioned items should be on board. To ensure a safe and enjoyable diving experience, someone on board must assume a leadership — divemaster — role in planning and coordinating the diving. Many times this is the same person who takes on the captaining duties. Other times it is the senior or most experienced diver. Whoever it is, there are a few things he or she should address. The first question is, “Where to dive?” There are a lot of variables here, but one thing that should not be overlooked is the experience level of those on board. The sites selected should not exceed the training and capabilities of the least experienced diver on board. When current and other water conditions are not a factor, sometimes the diving can be planned so that the more experienced members of the group do a challenging dive — deep or wreck, for example — while the less experienced members explore a nearby shallow reef. Recognizing the abilities of everyone involved and then planning the diving accordingly is the important point to remember. The group must decide between diving from an anchored boat and doing a drift dive. This most often is determined by water conditions and the underwater features of the area, but it is a decision that must be made. The entry and exit technique to be used is another decision that must be addressed. Safety and ease of getting in and out of the water are prime considerations. When it comes to planning the profile, knowledge of the site, or better yet, previous experience diving the site, is very beneficial. Here again, the profile should be geared to fall within the capabilities of the least experienced divers. Communications between divers at depth and between divers on the surface and the person/people left tending the boat are vitally important. Before anyone enters the water the captain and/or person serving as divemaster should thoroughly brief all divers on the appropriate signals to be used. It is not necessary to have a licensed boat captain or a certified divemaster on board; however, the tasks that fall under those job descriptions must still be performed. A qualified individual, usually the boat owner, must captain the boat and someone, usually the captain or an experienced diver, must step up to coordinate the diving activities. Even though most of the diving decisions can be made by majority rule, someone still needs to assume a leadership role. By making both boating safety and diving safety your primary concerns, you’ll have a rewarding diving adventure from your private boat. The captain of a running boat, whether it is making way or not, must be especially cautious when divers are in the water; not just divers from his or her own boat, but also divers from other boats in the area or from shore. Established by Congress in 1939, the U.S. Coast Guard Auxiliary is a division of the U.S. Department of Homeland Security. The auxiliary offers safe boating courses, vessel safety checks, harbor patrols, search-and-rescue missions, and marine environmental protection. America’s Boating Course is an in-depth boating safety course that can be taken online or in a classroom setting. The course provides the information needed to obtain a boat license or safety certification, which is required in many states. Additionally, many insurance companies offer discounts on boat insurance to boaters who complete America’s Boating Course. For more information, visit www.AmericasBoatingCourse.com. The Vessel Safety Check program is a complimentary check of your boat conducted by members of the auxiliary, confirming that it meets both federal and state requirements for safety. No citations are issued and the results of the safety check are not reported to any enforcement agency, but a decal is awarded to display that the vessel has passed examination. To learn more, go to www.SafetySeal.net.